250 pages | 102 B/W Illus. Winner of the ACSA/AIA Housing Design Education Award! There is an increased interest among architects, urban specialists and design professionals to contribute to solve "the housing problem" in developing countries. 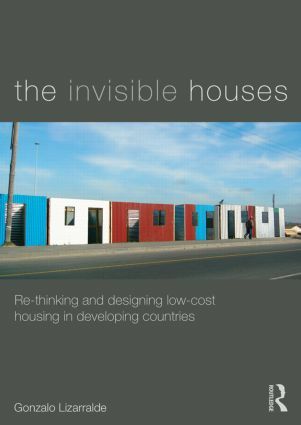 The Invisible Houses takes us on a journey through the slums and informal settlements of South Africa, India, Colombia, Honduras, El Salvador, Cuba, Haiti and many other countries of the Global South, revealing the challenges of, and opportunities for, improving the fate of millions of poor families. Stressing the limitations of current approaches to housing development, Gonzalo Lizarralde examines the short-, mid- and long-term consequences of housing intervention. The book covers – among others – the issues of planning, design, infrastructure and project management. It explains the different variables that need to be addressed and the causes of common failures and mistakes, while outlining successful strategies based on embracing a sustained engagement with the complexity of processes that are generally invisible. Gonzalo Lizarralde is a professor at the School of Architecture, Université de Montréal. He has more than 15 years' experience in the field of housing and project management in developing countries. He has authored more than 50 articles on the subjects of housing, post-disaster reconstruction and project management. He is a founding member of i-Rec, an international network for improving post-disaster reconstruction.